Chester Croquet Club members Helen Brophy and John Dawson competed in the All England Association handicap regional final held at Fylde over the weekend of 2nd and 3rd September. Both scored 3 wins out of 5 matches and narrowly missed qualifying for the national final. 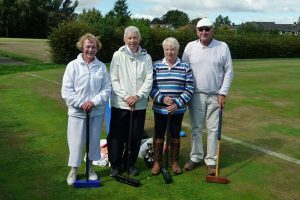 Chester Centurions Level Play Golf croquet team were denied a clean sweep in the NW Federation’s 2018 LPG league. Having won all 5 of their previous encounters, the Centurions, represented by David Crawford, Trevor Farrell and David Boyd (captain), lost their final match of the season on Thursday 6th September away at Pendle, by 11 games to 6. However, despite this loss, the Centurions finished as the 2018 LPG league winners, which was helped partly by Chester’s other team the Chariots beating Bowdon, the rival team for the top spot, leaving Pendle in second place behind the Centurions. On Friday 7th September, the finals of the Hermitage golf doubles took place. The internal competition took a different format this year with names being drawn out a hat each round. The final four were Maureen Ivens, Patti Evans, Sally Slater and competition organiser Pete Fey. Maureen and Sally were drawn together and played Pete and Patti in a best of three games. The first game was very close at 7-5 and the second game went to time with a win of 6-5 to Sally and Maureen giving them the overall title. On a very wet day on Saturday 8th September, the short lawn team of Sally Slater (captain), Val Sanders, Barbara Jones and Roger Edwards played at home against Southport. By lunchtime the lawns were under a lot of water and the captains agreed to abandon the match. Southport conceded the match to Chester who were winning 6-2.